There is one biblical book in particular that simply and clearly backs up all the evidence for literal everlasting destruction that we’ve amassed so far, the book of 2 Peter. God is telling us right here precisely what the eternal fate of ungodly people will be: The utter destruction of Sodom and Gomorrah is God’s example of what will ultimately happen to them. How exactly did God destroy these cities as an example? Why, by burning them to ashes. 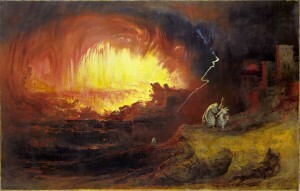 We know that this passage is referring to the second death because it states that ungodly people will experience a judgment similar to the incineration of Sodom and Gomorrah and the only time all the ungodly will experience such a fate is at the second death when God will “destroy both soul and body” in the lake of fire (Matthew 10:28). As you can see, the Bible clearly states here that Sodom and Gomorrah were destroyed by “eternal fire.” Yet, how could this be since the fiery destruction of these cities has long since taken place? 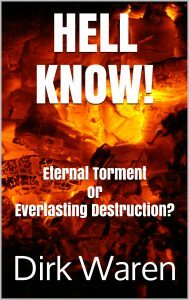 This proves that the phrase “eternal fire” refers to fiery destruction that lasts forever and not to eternal torture, as some teach because the fire that destroyed Sodom and Gomorrah has long since gone out, but their destruction remains. As always, the Bible is clear if we simply allow it to interpret itself and resist the temptation to attach our own biased meanings to words and phrases. We already addressed verses 7 & 9 in Chapter One, but here’s my point: 2:6 states that the ungodly will be burned “to ashes,” 3:7 that they will suffer “destruction,” and 3:9 that they will “perish.” Peter keeps bringing up the issue of the second death yet only speaks of it in terms of incineration, destruction and death. He doesn’t say anything at all about suffering perpetually in varying degrees of conscious torture. If this perverse belief were true, wouldn’t this section of Scripture mention it somewhere since it’s specifically dealing with the subject of the second death, the eternal fate of ungodly people? I think being tormented forever and ever is much too important of a detail to leave out, don’t you? The obvious reason Peter doesn’t mention it is because this teaching of eternal torture is not a biblical doctrine. It’s a human-invented myth, a satanic lie (as will be shown in the next chapter) that has been perpetuated for centuries by the formidable force of religious tradition. They are like brute beasts, creatures of instinct, born only to be caught and destroyed, and like beasts they too will perish. 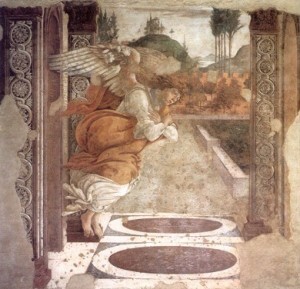 Peter is speaking by the inspiration of the Holy Spirit here and what he’s saying is obvious: “Born” is referring to being born into this world; “caught” is referring to the soul being held in Hades (HAY-deez), which takes place after physical decease, where it “awaits” resurrection; and “destroyed” is referring to what will happen after the soul & body are resurrected wherein the person is judged and cast into the lake of fire. For verification of this, Revelation 20:13 states that “death and Hades gave up the dead that were in them” to be judged and “If anyone’s name was not found written in the book of life, he was thrown into the lake of fire” (verse 15). NOTE: Whether one regards the state of the soul in Hades as conscious, sleeping or dead is not pertinent to the subject of eternal punishment, which is the subject of this study. This is obvious because Hades concerns the intermediate state of the soul between death and resurrection; this is a temporary condition and therefore not relevant to our study on the eternal destiny of ungodly people. See Chapter Five’s commentary on “the rich man and Lazarus” and Appendix B Understanding Human Nature (particularly the final portions) for more biblical information on the nature of Hades. See Part II of this study, Sheol Know, for a thorough biblical examination of Hades. NOTE: Hades is the equivalent to the Hebrew Sheol (sheh-OHL) as a comparison of Acts 2:27 and Psalm 16:10 will verify; the former quotes the latter, supplanting the Hebrew Sheol with the Greek Hades. Please notice that 2 Peter 2:12 plainly teaches, once again, that ungodly people will be destroyed in the lake of fire, not sadistically tortured endlessly. The Greek word translated as “destroyed” here is phthora (fthor-AH). Paul used this very same word to describe our present mortal, “perishable” bodies in contrast to the immortal, imperishable bodies that believers will receive at their resurrection (1 Corinthians 15:42). This is yet another word that we can add to the seemingly never-ending list of biblical words which refer to the second death strictly in terms of complete destruction and utter perishment. Also notice from the above text that ungodly people are likened to “brute beasts, creatures of instinct.” The word ‘beasts’ here is translated from a Greek word which means “animals” (Strong 35). Now note what the latter part of verse 12 states will happen to these ‘animals:’ “and like beasts they too will perish.” So the Bible clearly likens unrighteous people here to animals, creatures of instinct, and states that they will ultimately perish in the same manner as animals. Since this is so, the question is naturally raised: How do animals perish? Do they perish by being consciously tortured forever and ever? Do they perish by having their “well-being ruined?” Do they perish by spending eternity “separated from God?” No, they perish by simply ceasing to exist (though, of course, some amount of conscious suffering is involved in that perishing). This is not an isolated instance in Scripture as Psalm 49:20 says that “A man who has riches without understanding is like the beasts that perish.” The word ‘beasts’ in this text likewise refers to “animals” (Strong 19). One might suggest that this passage is referring to the first death, not to the second death, but this can’t be so because rich men with understanding as well as rich men without understanding will both ultimately suffer the first death. 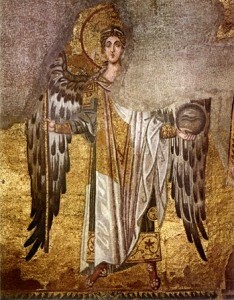 Besides this, the writer of the Psalm states in verse 15 that “God will redeem my life from the grave (Sheol); he will surely take me to him.” The Psalmist confidently believed that God would redeem him from Sheol/Hades, whereas we can confidently deduce that “the man who has riches without understanding” will be resurrected from Sheol/Hades on the day of judgment to be judged and cast into the lake of fire, where like beasts he will perish. It’s important at this point to emphasize that the view of literal everlasting destruction does not in any way deny the existence of hell; although this is obvious I’m compelled to bring it up because adherents of eternal torture often try to give this impression. Let me give you an example: a popular fundamentalist heresy hunter had one of his sermons aired on the radio to defend the doctrine of eternal torment in response to the view of everlasting destruction. NOTE: Most such “heresy hunters” are not interested in biblical truth but rather in hunting down and discrediting anyone who deviates from their idea of proper Christian orthodoxy; in other words, truth is not the issue, but rather blind adherence to the established and accepted teachings of their religious tradition. The title of this man’s sermon was “Why I Believe In Hell.” There are two problems with this title. The first is that it gives the impression that adherents of everlasting destruction don’t believe in hell while supporters of eternal torture do. This isn’t even remotely true. Adherents of both everlasting destruction and eternal torture believe that hell, the lake of fire, exists and that ungodly people will be cast into it on judgment day. The issue of contention concerns the nature of punishment these people will experience in the lake of fire. The Bible calls it “the second death” (Revelation 20:14-15). Does this second death consist of eternal conscious torment or literal everlasting destruction? You see, the issue is not whether hell exists, but what happens there. The obvious reason supporters of eternal torment resort to such tactics is because they don’t want people to be exposed to the monumental scriptural support for everlasting destruction. If they can successfully malign adherents of literal destruction as “heretics who don’t believe in hell,” most Christians won’t even consider the immense biblical support for everlasting destruction. After all, if they can keep people from studying it they can keep them from believing it. The reason they take this approach is because they cannot disprove literal destruction scripturally; they therefore attempt to keep people from considering the position altogether by misrepresenting it. Another common avoidance tactic they implement is to say that everlasting destruction is a cultic belief because a couple of cultic or borderline cultic organizations adhere to it in one form or another. Such an argument successfully diverts attention from the proof of Scripture, which is where any teaching ultimately stands or falls. See Chapter Six’ “Cults Teach Everlasting Destruction — It Just Doesn’t Look Good” as to why this argument holds no water. The second problem with the sermon title “Why I Believe In Hell” is the vagueness of the word ‘hell.’ Although ‘hell’ usually conjures up ghastly medieval images of people suffering eternally in fire pits, the term means different things to different people. It can just as easily provoke cartoony images from The Far Side comic strip or, to people like me, biblical impressions of Gehenna, the Valley of Hinnom (see Chapter Two). My point is that advocates of literal destruction could just as well title a sermon “Why I believe In Hell,” but refer to ultimate extinction of the ungodly with no hope of resurrection. The reason supporters of eternal torment like to use the word ‘hell’ is because it’s a good cover-up term for eternal conscious torture. What do I mean by this? When they speak of ‘hell’ they’re actually referring to never-ending fiery torment in separation from God with no merciful pause to the roasting misery. This, of course, is way too heinous of a concept to spell out in this manner, so they simply use ‘hell’ as a code word to covertly refer to it. A much more honest and accurate title of this man’s sermon would be “Why I Believe in Eternal Conscious Torture of the Damned.” Why are supporters of eternal torment so reluctant to honestly and accurately spell out what they really believe in this manner? Why do they feel they must hide behind code words and other misleading words and phrases (e.g. “perish,” “death” and “eternal separation from God”)? Naturally because if they spell out what they really believe it would expose their belief as the sadistic sham that it is. The bottom line is that the view of everlasting destruction does not in any way, shape or form deny the reality of hell, the lake of fire; all it denies is the Roman Church’s traditional teaching that people will suffer never-ending conscious torture there. I believe it’s also important to emphasize that the view of literal everlasting destruction allows for all the conscious pain that divine justice might require for any sinner to suffer according to his or her personal degree of guilt. In other words, the second death does not necessarily occur in an instant; yet the extinguishment of conscious life will ultimately occur as any suffering experienced mercifully ends in death — eternal death — death that lasts forever. As you can see, according to God’s just judgment, conscious suffering will be meted out to “Babylon” in direct relation to the sinful excesses in which she indulged. She is to get back punishment “as she has given,” and this penalty will apparently be doubled. Doubling the payback is in keeping with God’s character as this is exactly how He judged his very own nation of Israel (see, for example, Isaiah 40:2 and Jeremiah 16:18). Chapter 18 goes on to inform us of the “torments” Babylon will suffer (verses 10 and 15). Yet this suffering will end in complete destruction as Babylon will be utterly “consumed by fire” (verse 8), just as this entire present earth will ultimately be destroyed in preparation for the new earth (2 Peter 3:10-11). Consider it this way, if you jumped into a bonfire, would you not experience conscious suffering for a brief period of time before losing consciousness and ultimately burning to death? Of course you would. It’s the same principle with the second death when God casts the damned into the lake of fire; the difference being that the period of suffering will be meted out to each individual according to their degree of sinful guilt as divine justice properly dictates. The period of conscious suffering may last a split second, one minute, an hour, a day, a week, or longer. It all depends on whom we’re talking about. Are we talking about the little old ungodly lady who lives down the street or Adolf Hitler? Hitler is responsible for the horrible suffering and deaths of millions upon millions of people. Perhaps God will determine that he deserves to experience the suffering and death of those millions of people before his ultimate extinction. We don’t know, of course; I’m just speculating. It’s all up to the Supreme Judge to decide. Adherents of the eternal torment theory have used this text to support the idea that there will be varying degrees of ceaseless torture — as if never-ending torment is not bad enough (rolling my eyes). For example, in the case of Capernaum, eternal torturists would say that the people of this city will receive a harsher judgment and, consequently, a greater degree of perpetual roasting torment. The notion is absurd. The whole point Jesus is trying to make in this section of Scripture (Matthew 11:20-24 and Luke 10:12-15) is that the unrepentant cities of Chorazin, Bethsaida and Capernaum, where he preached and performed great miracles, are guilty of even greater sins than the infamous cities of Tyre, Sidon and Sodom. Because of this, Jesus states that it’s going to be “more bearable… on the day of judgment” for Sodom than those unrepentant cities. Please note that Jesus said it would be more bearable on the day of judgment, not more bearable for all eternity experiencing fiery conscious torment in the lake of fire. Jesus is simply pointing out that, on the day of judgment, the second death will be more bearable for the people of Sodom than for the people of Capernaum according to divine justice. Why? Because the people of Capernaum are guilty of a greater degree of sin. That’s simple enough to understand, isn’t it? We should just allow Scripture to say what it literally says and not feel compelled to add to it or take away (Revelation 22:18-19). In this case, adherents of eternal torment read way too much into Jesus’ simple statement, no doubt because they’re desperate for biblical support of their position. Jesus also implied that God’s enemies would experience varying degrees of conscious suffering at the second death when he stated that corrupt religious teachers would “receive the greater condemnation” (NRSV) or “will be punished most severely” (Mark 12:40 & Luke 20:47). We’ve already determined from numerous passages that the unredeemed will suffer utter destruction of soul in body at the second death, but — obviously — some will justly experience a severer degree of conscious suffering when this destruction occurs. We observe here three crystal clear passages from the three most important sections of the Bible — the Torah (or Pentateuch), the Gospels and the Epistles; and all three clearly reveal that God’s offer to humanity is life or death. This has already been stressed in Chapter One, but it bears repeating: life and death are the two polar opposites, not life-in-bliss and life-in-burning-torment. As John 3:16 says, God doesn’t want anyone to perish. Deuteronomy 30:19 above even shows God imploring people to wisely “choose life.” But the LORD’s attitude is that if people want to reject wisdom’s call and foolishly choose sin & death that’s their choice. They have the free moral right to do so. Such fools are not worthy of God’s kingdom anyway. (In a sense, of course, no one is worthy of God’s kingdom, but Jesus plainly spoke of “those who are considered worthy of taking part” in God’s kingdom [Luke 20:35-36]. Who are these people whom Jesus says are worthy? Simply those humble, repentant folks who wisely decide to forsake the folly of sin & death and “choose life” through Christ). In regards to utter extinction in hell not being severe enough, how much severer should it justly be? How much severer does it need to be? 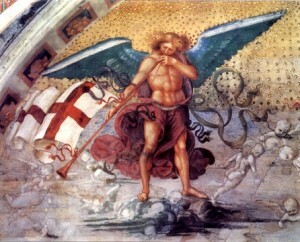 Just imagine how it will be on judgment day for those people who foolishly reject God: They’ll have to stand before the Almighty, who will judge their entire lives, and condemn them to death in the lake of fire — an annihilation so utterly complete that it will be as if they had never existed (see Obadiah 16). Then they’ll be removed from His presence and cast into a vast, consuming lake of fire. Can you imagine the depression, shame, guilt and torment of being rejected by the very Creator of life who has judged the individual’s life so completely worthless that he or she must be absolutely snuffed out of existence and memory? Can you imagine being led to a vast, dreadful lake of fire, standing at its edge, knowing that this is it — your life’s going to be blotted out and there’s absolutely no hope of resurrection, restoration or recovery? And then, finally, the torment and pain experienced when cast into the fire — suffering that will last precisely as long as God’s justice requires. I’m taking the lake of fire in the literal sense here, and why not? If the plain sense makes sense and is in harmony with other scriptural passages we shouldn’t look for any other sense lest we end up with nonsense. Yet, because some would argue that the book of Revelation is a book of symbols, let’s consider the possibility that the “lake of fire” is a metaphor. Even if this is so, the Bible precisely defines this ‘metaphor’: “The lake of fire is the second death” (Revelation 20:14b). So regardless of whether we take the “lake of fire” literally or figuratively, it is certain that it refers to the execution of the second death. Taking it metaphorically does not make it any less serious or dreadful. As it is written: “It is a dreadful thing to fall into the hands of the Living God” (Hebrews 10:31). Can anyone look me in the eyes with a straight face and tell me that such a terrible and utter obliteration as this is not severe enough? I must ask once again, how much harsher does God’s just judgment on humanity need to be? I’m flabbergasted that anyone would suggest that this is not a severe enough punishment. In fact, I’ll go so far as to say this (with no apologies): Anyone who feels the unrighteous should suffer a severer punishment is sick, sadistic and wicked. If literal everlasting destruction is not a severe enough punishment to motivate people to “choose life” and serve God, then what inspires me and numerous other people I know who adhere to this view? Like everyone else, I have my share of flaws and weaknesses, but I consider myself a devoutly committed Christian who has been serving God for over thirty years. I don’t need a constant heinous threat of eternal roasting torture to be faithful to God. (I’ll reveal why momentarily). And what does it say about the character of people — or perhaps I should say lack of character — if they need a constant threat of perpetual agony to live a remotely godly life? Does God really want or need such people serving in His kingdom? Can such characterless brutes serve at all? I am reminded of a person I worked with for one day. We took a company van and drove out to do a job. Since we spent considerable time driving we had a lot of time to talk. On the way back the subject of hell was brought up (he was aware of my view and wanted to contest it). He wasn’t a very mature Christian or very knowledgeable in the Scriptures, but we dialogued on the issue and toward the end it got pretty heated. When I pulled up to his apartment to drop him off, he said something to the effect of, “Well, I need the threat of eternal torment to motivate me to live right.” He proceeded to get out of the van and walked to his apartment where he was living in fornication with a woman. Shortly later he was fired for stealing. So much for the view of eternal torture inspiring people to live right. One last important comment on this matter: The argument that literal everlasting destruction is not a severe enough punishment to motivate the common person to follow the LORD is based on a flawed, perverted view of Christianity. It implies that living a Christian life faithful to God is so utterly boring, rigid and lifeless that it’s going to take an over-the-top ghastly threat to coerce people into actually living it. Such thinking like this comes straight from the kingdom of darkness. I’ve lived on both sides of the fence — I lived the supposed “wild & crazy” lifestyle until I was 20 years old and I’ve been following God’s way ever since — and I can testify that there is nothing more joyous, exciting, empowering, peaceful or liberating than living a biblical, Spirit-led Christian lifestyle. Being in fellowship with the Creator of the universe is a never-ending party as God is truly the ultimate “drug.” In fact, the Bible describes the LORD as “the fountain of life” because life itself literally gushes from him (Psalm 36:9), not sterility, dullness and death! Only God can fill that emptiness within us. This is not to suggest, of course, that the Christian life is void of troubles, hardships or trials — far from it — but any misery one might experience in obedience to God is nowhere near the misery experienced in disobedience to Him, if you know what I mean. We need to always remember that Jesus came to set people free (see, for instance, John 8:31-32,36 and Galatians 5:1). So if you’re a Christian and the lifestyle you’re experiencing is boring, rigid and lifeless, I’ve got news for you, you’ve settled for a counterfeit gospel! Open your eyes, dig deeper, examine yourself & your supposed relationship with the Most High and perhaps find a really biblical church to attend. Genuine Christianity is a relationship with the Almighty Creator of the universe, not another life-stifling, growth-stultifying religion (see Acts 14:15)! A similar argument is that literal everlasting destruction is not a severe enough punishment to motivate Christians to evangelize. The obvious implication is that the reason Christians share the gospel is to save people from a supposedly loving God who will condemn them to consciously roast in a never-ending hellhole of torments if not reached. Is this really why Christians should evangelize? I am reminded of a statement a woman made addressing a congregation of Christians: “If I really believed what I say I believe [i.e. that God will subject the majority of humanity to everlasting fiery torture] then I’d be running up and down these streets banging on doors preaching the gospel.” If she were to actually do this you can be sure that — unless God intervened with some spectacular miracle — no one would get saved because they’d writer her off as a religious weirdo; in other words, she’d drive people away from God rather than to Him. But, she’s right in a way. Very few Christians really believe the doctrine of eternal torture. Oh, they may affirm it with their mouths so as to appear faithful to (supposedly) fundamental doctrine and not go against the grain, but most believers secretly suspect that it’s not really true; and this ultimately reduces their faith in the authenticity of the Bible because they’ve been misguided into believing that the Scriptures adamantly teach never-ending torment. The whole purpose of this study is to show that this perverse teaching is not and never was a genuine Christian doctrine. So why should Christians evangelize? Mainly because they love God and want to obey his commands, including ‘the Great Commission’: “Therefore go and make disciples of all nations… teaching them to obey everything I have commanded you” (Matthew 28:19-20). Because Christians have come to know God, who is love (1 John 4:8), they naturally want to share this love with other people as the Spirit guides them; it goes without saying that this must be done in love. Most of us have unfortunately experienced Christians sharing the gospel out of a dead works-mentality rather than in a spirit of Christian love & joy. The results are usually disastrous. Such people inevitably drive others away from God rather than to him. Jesus plainly stated that authentic Christians will be recognized “by their fruit” (Matthew 7:16,20); he was talking about the “fruit of the spirit,” the primary fruit being love (see Galatians 5:22-23). Thus any good works performed by a believer must be an extension of this fruit, an extension of love. This explains why Jesus warned of “ministers” who may indeed be performing great works like prophesying, healing, miracles and exorcism but fail to consistently display a character of love, joy, peace, humility, kindness, gentleness, etc. (see Matthew 7:15-23). In such cases the “good works” are merely a performance. The lack of “fruit” exposes them as frauds. What are some other motivations for evangelizing? The gospel is referred to as “the message of reconciliation” in the Bible (2 Corinthians 5:17-20). Christians share the good news to reconcile people to God so that they may know the Creator of the universe. Obtaining eternal life is merely a byproduct of this union. Jesus said “the truth will set you free” (John 8:32), Christians share the gospel to set people free — free from sin, addictions, disease, poverty, depression, hopelessness, meaninglessness, false beliefs and legalism. Christians share the gospel to offer life to those who are on the highway to destruction. We must understand that God is in a sense is kick-starting his coming kingdom in this present evil age — the coming kingdom which will be established eternally in the age of the new heavens and new earth; and he’s doing this through his faithful servants, his kingdom “ambassadors.” This clears up the issue of why Christians should be motivated to share the good news of the gospel. Some may legitimately ask, “What about the millions of people who have never heard the gospel? Or the millions and millions who may have heard but never truly accepted it because they failed to understand it or were force-fed a religionized, faulty version of the gospel, or rejected it because of the hypocritical medium through which it was delivered (e.g. the gospel came to a lot of people with the baggage of imperialism, etc. )?” See the section in Chapter Eight Post-Mortem Evangelization — Can a Person Be Saved After Death?, as well as Inclusivism and Restrictivism. One last point: Christians often have a narrow understanding of the Great Commission. They tend to think that if they’re not fulfilling a good evangelistic quota on a regular basis that they’re not fulfilling this commission. Yet, did you notice what Jesus actually said in the Great Commission quoted above? He said that Christians are to “go and make disciples of all nations… teaching them to obey everything I have commanded you.” You see, the Great Commission involves much more than merely convincing people to pray the sinner’s prayer; it involves teaching people the rightly-divided Word of God (not just part of the Word but the whole Word from Genesis to Revelation) and how to walk in newness of life. With this broader understanding, I’m actually fulfilling the Great Commission by writing this book! I’d like to close this third chapter of support for everlasting destruction by focusing on an important statement made by Paul the apostle. Paul is by far the most important figure in the New Testament aside from Jesus Christ. Over half of the book of Acts, which is a Biblical documentation of the early church, is devoted to Paul’s exploits in ministry. About one third of the entire New Testament and nearly two thirds of the epistles were actually written by Paul under the inspiration of the Holy Spirit (see 2 Peter 3:15-16). Why was Paul “innocent of the blood of all men”? Simply because everywhere he went he fully proclaimed the gospel — the whole counsel of God. Paul didn’t hide anything that the Lord revealed to him, he didn’t hide any aspect of the gospel message — he shared it all. He was thus innocent of “the blood” of all people. My point is that if Paul fully proclaimed the whole counsel of God, as Scripture verifies, then he would have certainly mentioned something somewhere about unrepentant sinners suffering eternal conscious torment if this doctrine were true. After all, this is way too important of an issue to forget to mention, yet Paul says absolutely nothing about eternal torture anywhere in his inspired writings or in his exploits as recorded in Acts. Out of the fourteen biblical letters written by Paul (assuming he’s the writer of Hebrews) in all but six of them he repeatedly made very clear statements about the eternal fate of those who reject the gospel of reconciliation. Although we’ve already looked at many of these passages, let’s review them here. As you will see, viewing everything Paul consistently taught concerning the nature of the second death is powerful and illuminating. In various ways with various words Paul was sure to repeatedly declare precisely what would happen to those who foolishly reject the gospel. He was sure to do this because God appointed him to fully proclaim the whole counsel of God. Paul didn’t hide any aspect of the truth — including the awful truth that those who reject Christ will be utterly destroyed by the raging, consuming fire of the Lord. If words have any meaning at all then this is what we must conclude. Allow me to add that if Jesus supposedly preached eternal torture, as many contend, then Paul would have certainly backed it up. Yet Paul taught no such thing because Jesus taught no such thing, not to mention the Bible they taught from — what we now know as the Old Testament — teaches no such thing. Lastly, I’d like to point out that, in Acts 20:26-27, quoted above, Paul declared he was “innocent of the blood of all men” because he didn’t hesitate to share the whole counsel of God, including the unfortunate news of what would ultimately happen to those who reject the gospel. The very fact that Paul said he was innocent of the blood of all people is a sure indication that people will actually die when they suffer the second death. Whether physical blood or spiritual blood, it doesn’t matter, the fact is that people’s blood will spill on the day of judgment, which is called “the day of slaughter” in the Bible (James 5:5). Gehenna, often translated as “hell” in English Bibles and used as a symbolic reference to the lake of fire, was also known as “The Valley of Slaughter.” “Slaughter” plainly signifies that blood will be spilled, and the simple fact is that when blood is spilled people die. Paul’s statement makes no sense whatsoever if people don’t really perish in the lake of fire, if people exist forever in conscious torment their blood would not be spilled at all — they’d still be alive, forever. You may have already answered this elsewhere but I haven’t come across it yet. In all of this discussion about divine justice applying varying levels of punishment to people, and conditional immortality only being granted to believers, where does that leave the fate of the aborted/unborn, infants/children, and mentally handicapped? Are they eternally extinguished for their lack of belief but simply without punishment for their lack of sinful acts? Or is there some other path for them? Issues like this are addressed in Chapter Eight of HELL KNOW, albeit the published version and not so much the web-version. As for mentally handicapped people, who says they can’t believe for salvation? But if, in fact, they couldn’t do so they would fall within the similar category of people who die without having the opportunity to accept the message of eternal life for one legitimate reason or another, like aborted babies and children. Anyone who dies before reaching the “age of accountability” would presumably go straight to heaven since they wouldn’t be held accountable for their sin (the wages of sin, of course, being death). The “age of accountability” refers to the age that youths are held accountable for their sins by God. Theologians typically place the age at 13 based on the Jewish custom that a child becomes an adult at 13, but the Bible doesn’t actually say this. Interestingly, God only held Israelites 20 years-old and older accountable for serious sins of unbelief committed during the Hebrews’ desert journey to the promised land (Numbers 14:29-30). No doubt the age of accountability varies according to the maturity level of the individual and the severity of the sin in question. Basically, people who die before the age of accountability never really had a chance to make a responsible decision regarding the message of reconciliation; and many of these never even heard it (or, if they did, they weren’t mature enough to comprehend it or even understand their need for it). 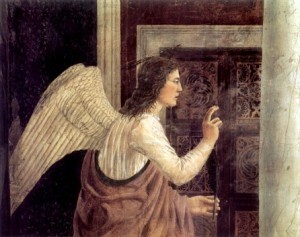 It is speculated that when these types of people stand before the LORD for evaluation of their lives that they’d have to undergo some type of “simulation test” wherein it would be determined how they would’ve responded to the message of Christ had they grown to adulthood and had the capacity to make a responsible decision. After all, would it make sense to grant someone eternal life merely because they died before the age of accountability and would’ve rejected the gospel if, in fact, they had lived to maturity? For more details, see Chapter Eight of HELL KNOW, preferably the published version, which is available here at a low price. I wonder as a pastor I emailed says hell is a place for people to learn or be rehabilitated after they have undergone a period of time. I wonder that as Christ suffered on the cross saying my God why have you forsaken me, that is such love that he did what he did and CS Lewis says hell is more like a slum; I read his book on the people from hell on a bus, lol. One minister said once that hell was the mercy of God who warned you to flee from the wrath to come. I am not sure why people think hell is torture for sure it seems more like CS lewis said in a way, lol. Christ’s love with the father is so great beyond our puny love that some say that is a hell itself — being God-forsaken. a pastor I emailed says hell is a place for people to learn or be rehabilitated after they have undergone a period of time. This is a form of universalism, which is discussed in this chapter and, particularly, in this section. Thankfully, we don’t have to speculate as God’s Word tells us everything we need to know about human damnation. This is why both of my web-books on the topic are based solely on what the Bible itself says about human damnation and all connecting topics, like the nature of Sheol/Hades, which concerns the intermediate state between death and resurrection. So, take your time and peruse through both Hell Know and Sheol Know, Glenda, as they address every pertinent passage & question on the subject. Just click either of those links and they’ll take you to the Contents Page of each book. Please contact me at dawaren@msn.com if you have any questions, comments or insights. Thanks! You’re most welcome, Ana; God Bless You!